English painter. Rejected from military service in 1941, he shared a studio in London with Lucian Freud, provided by their patron and friend Peter Watson, a figure of immense importance to Craxton’s early development. Through Watson he met with other artists associated with NEO-ROMANTICISM and like many of his generation he fell heavily under the influence of Graham Sutherland and Samuel Palmer, as seen in Poet in a Landscape (1941; London, Christopher Hull Gal.). By 1943, in such works as Welsh Estuary Foreshore (Edinburgh, N.G. Mod. A. ), a marked departure could be recognized. Its reference to the work of Pablo Picasso and Joan Miró placed him in a more European context. 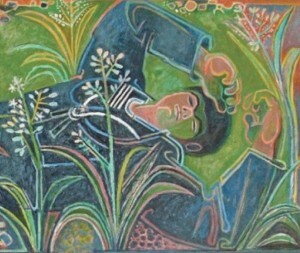 After World War II he travelled around the Mediterranean, finally settling in Crete in 1960, where he continued to develop his Romantic pastoral themes. The influence of William Blake gave way to that of Cubism, and he also became interested in Byzantine art.